The first Grindleton Bridge was built sometime in the second half of the 19th century. It was of limestone and iron. The original land arch and river pier remain but the deck and the two main arches were replaced in steel in the 20th century. The bridge remains in use for road traffic. Grindleton Bridge crosses the River Ribble midway between the Lancashire villages of Grindleton (formerly in the West Riding of Yorkshire) and Chatburn. The river level here rises rapidly after rain, making fording the water hazardous. Anecdotal evidence suggests that there were footbridges and a ferry in the area. The original bridge seems to have been constructed after 1845 but before 1890, probably built as a transport route to connect with the railway line through Chatburn (opened June 1850). The 1845 Ordnance Survey map shows a ford and stepping stones at the site, around 50m upstream (east) of the bridge, which first appears on the 1890 Ordnance Survey map. The structure sits almost perpendicular to the river flow, covering the shortest possible distance. The connecting road along the river’s north bank turns sharply south to meet the north end of the bridge, while the road along the south bank has a tight bend to the north to join the south end of the bridge. The bankside abutments and single river pier with pointed cutwaters are of limestone masonry. The abutments are topped by substantial pillars on each side of the bridge, leading into masonry parapet walls for the approaches. On the south side, behind the abutment and under the bridge approach, is a semicircular arch constructed using a single ring of voussoirs (wedge-shaped stones). It acts as a storm water or flood relief arch and a cattle creep. The two river spans carried the bridge deck on a latticed iron structure, each measuring a clear 12.2m long between supports and 4.6m wide between parapets. The south span was strengthened (date unknown) by iron bracing beneath the deck, horizontally midspan descending diagonally into the supports. 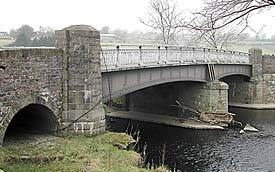 In 1934-5, the bridge was reconstructed by West Riding County Council. The original lattice river spans were removed and replaced by riveted steel girders with curved soffits supporting fabricated steel cross beams on iron bearing plates. The new deck is a steel trough with Tarmacadam surfacing. The new south span is now 12.3m long and the north one 11.6m. The bridge is 9.1m wide between parapets consisting of open cast iron railing panels. It carries a two-lane carriageway 6.1m wide flanked by 1.5m footways. Concrete arches were constructed to widen the flood relief and cattle creep to 3.1m span. The south was rebuilt in stone-faced concrete. The existing pointed cutwaters of the river pier were extended upwards to meet the new steelwork.